Advantages: Great reference for the UH family of Helicopters & their use in the Vietnam War. This book is No 36 in the continuing Squadron Signal publications series of 'Walkarounds'. It is authored by Wayne Mutza with colour by Don Greer and David Gebhardt. Additional colour illustrations are supplied by Darren Glenn. A brief history of the type is given at the start of the book then moving straight into describing all the differing sub-types and modifications made to the basic model as it evolved with different needs and roles. Almost every part of the airframe and modifications are shown both in black and white and colour photographs. Colour is used on every second page spread and there are 4 pages of artwork near the rear of the book showing differing schemes and markings mainly from the Vietnam conflict. The Royal Australian Air Force flew UH-1B, D and H models in the Vietnam conflict and does rate a mention with a sole picture of a UH-1D (aircraft A2-773) on a mission. Two sets of performance statistics and line drawings covering a UH-1B and UH-1N are also supplied. From a modelers perspective if you were going to model a UH-1 Iroquois this book would be an indispensible resource. The number of detail photos of all areas of the airframe is superb and pictures of the differing armament selections is amazing and you would be hard pressed to know of one that is not shown in this book. For the diorama makers amongst us, there are also numerous photos showing Hueys undergoing maintenance and preparations for missions so there are lots of ideas. 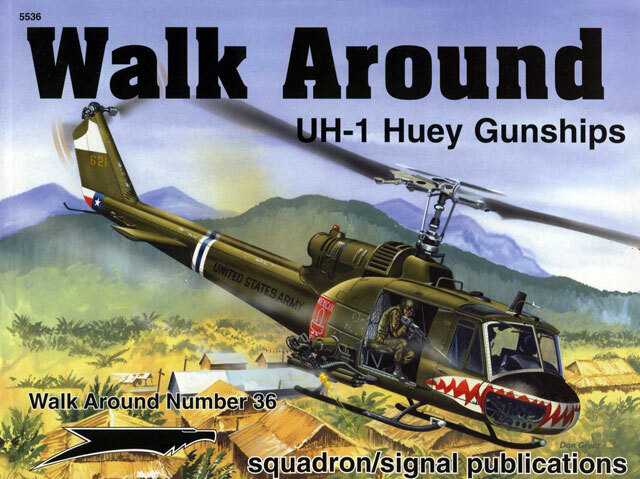 As stated above if you are going to model a UH-1 this is the book for you. I found the book is easy to read, the printing is up to 'Squadrons' normal standard and the colour / black and white photographs are all well used and nicely set out. Another excellent publication from this supplier.